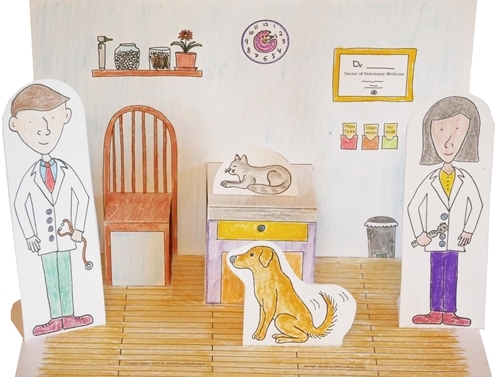 Dr. Chuck's Pop-Up Veterinary Clinic Paper Playset! Download, Print, Color, Fold! Free printable veterinary playset! Now you can help your own animal patients! Just print, color, fold, and play! Free PDF downloads include printable clinic rooms, doctors, technicians, and pet patients! For best results, print playsets on a heavy-weight cardstock. It's easiest to color first, then cut out and fold the playset. Then play! Click Here for the Exam Room playset! Click Here for the Laboratory playset!